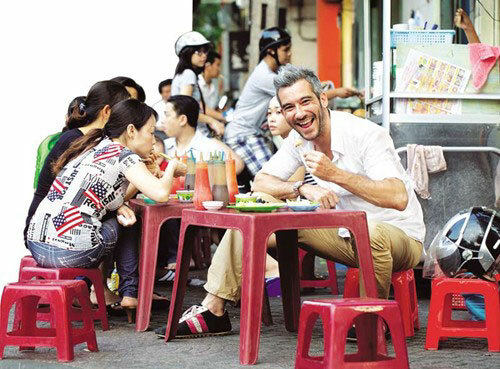 Winter in Hanoi is said to be the coldest weather in the world; even without snow, Hanoi is filled with freezing coldness, making its people closer to each other, finding temporary shelter for warmer sources of life. 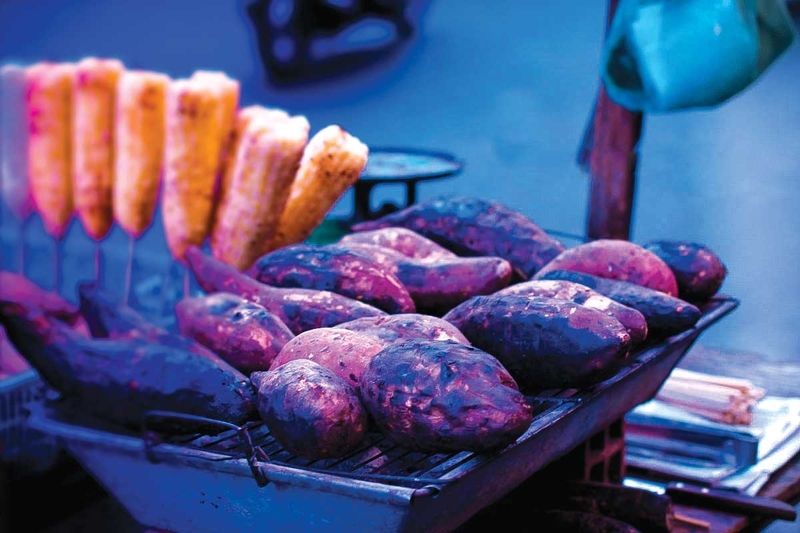 Street vendors with fire stoves and baking hot snacks, which tastes better when it is colder are ideal places for any food lovers. The following is a list of some of the most typical snacks that have become a part of winter in Hanoi. One thing for sure is that just a glance at them can immediately make your mouth watering. 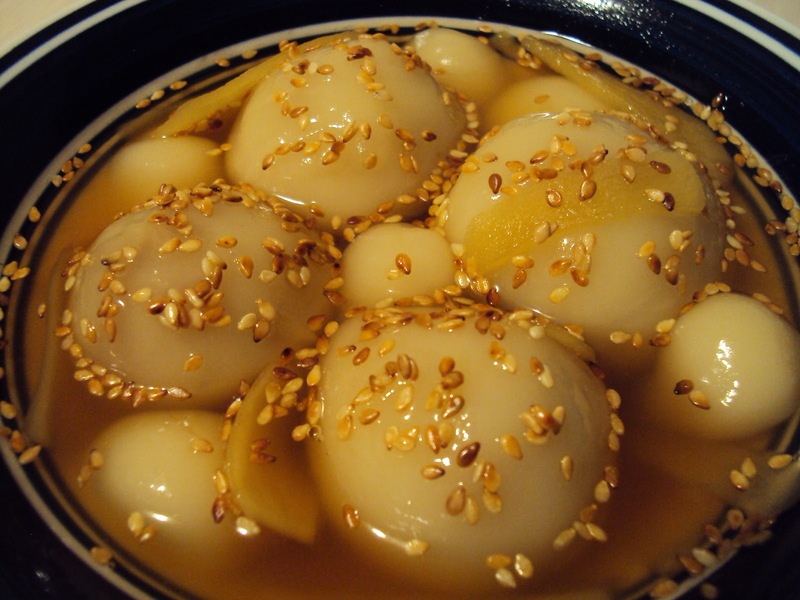 Let’s take a bite of these to feel the spirit of Hanoi winter. 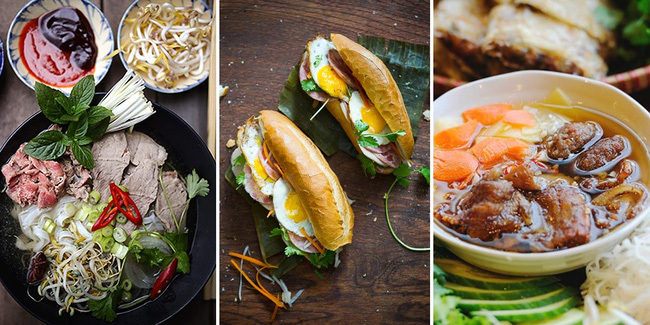 These are among the most interesting dishes in winter of Hanoi. 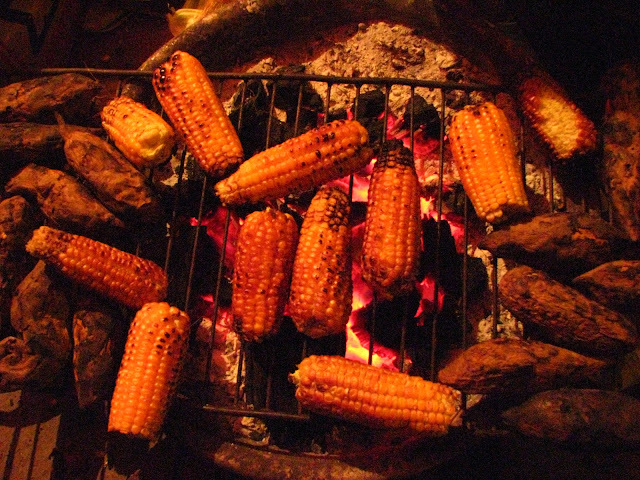 Without any special recipe, just newly harvested corns and sweet potatoes are grilled over charcoal. 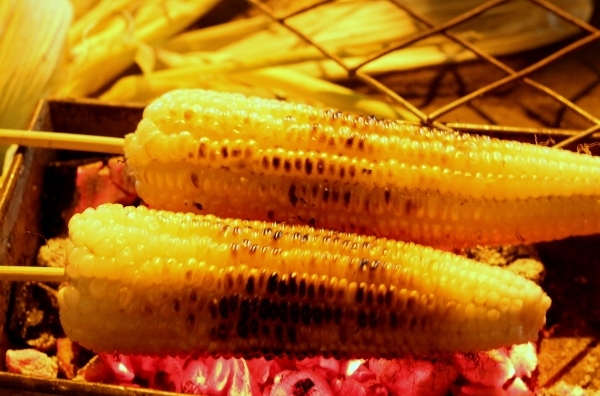 However, it is the scent of the grilled corn coming along with chilly winds of winter nights that always brings a bit of warmth inside many Hanoians. Under the skillful hands of medium-aged women, if the corn becomes hard and browned in the cover but still glutinous, sweet and packed with cozy flavors inside; those hot sweet potatoes with extreme sweetness will surely warm you up and wake up senses of life. If you have time visiting the oldest bridge in Hanoi, Long Bien bridge over the Red river, where strong vehicles are not allowed to travel by, you can immediately find small stalls located on the sidewalk, simple but enough to light up the night. 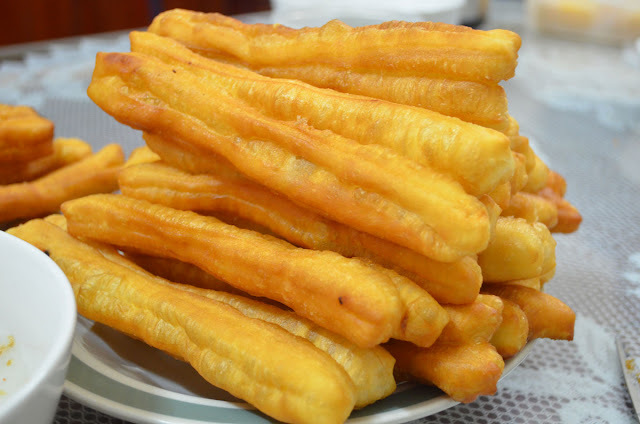 Fried cake is a popular snack you really should try during those winter days of Hanoi. In the past, this special cake was only made at home by mothers and grandmothers for their children as it required being served hot. 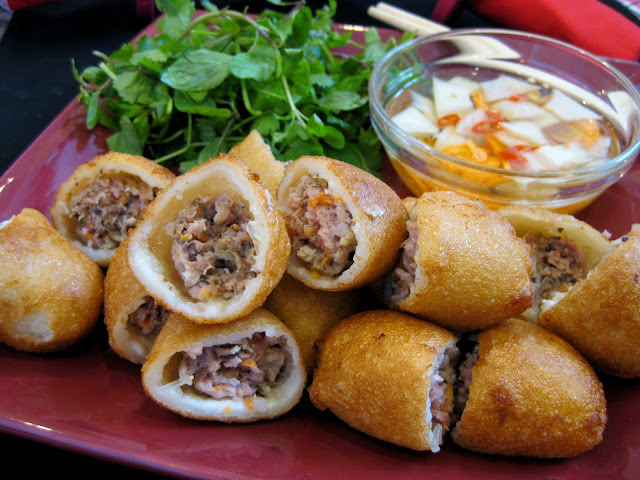 With ingredients inside similar to those of northern spring rolls, crispy outer skin and indispensable sweet and sour dipping sauce, Vietnamese savior fried cake is an amazing solution to regain energy during such easy-to-be-hungry days of winter. 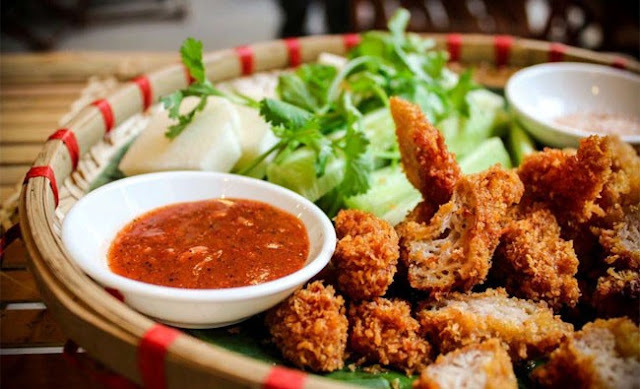 You can visit 52 Ly Quoc Su, near Hoan Kiem lake, or 242 Lac Long Quan, on the way to West Lake to try the most genuine and stunning savior fried cake. However, to be on time and lucky enough, ‘cause there’s nothing left for those who come too late. 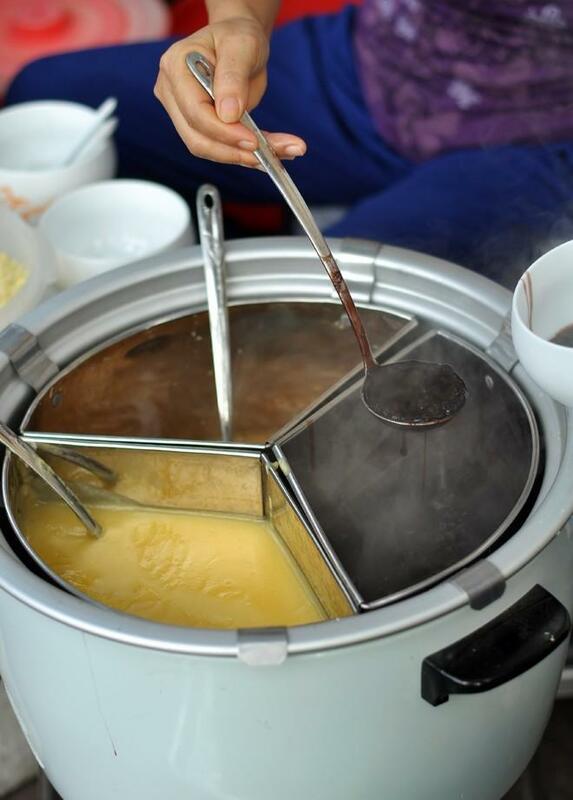 It is not so difficult to come across a porridge stall serving that common afternoon treat. However, to find the most genuine and delicious mussel porridge is still an art for even permanent residents of this hustle city. 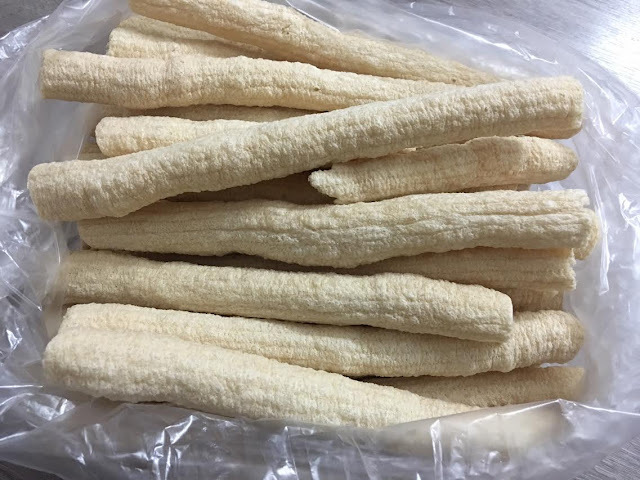 Besides being served on its own, “quẩy” – breadstick is often broken apart and dipped into the congee or noodles to serve as a crunchy accompaniment to the dish. For those chilly days, Vietnamese rice porridge with mussel, chopped dill, fried shallot and a sprinkle of black pepper is the very comfort food of choice. 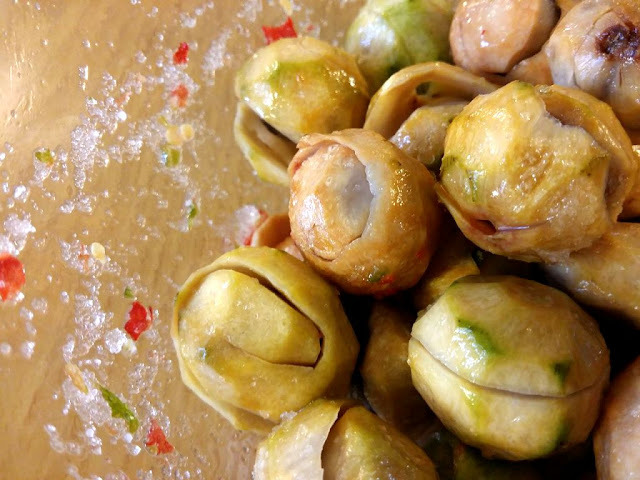 Boiled snails and deep-fried pork rolls are well combined with one another and have been regarded as the most popular snacks of the youth, especially preferred in freezing days. 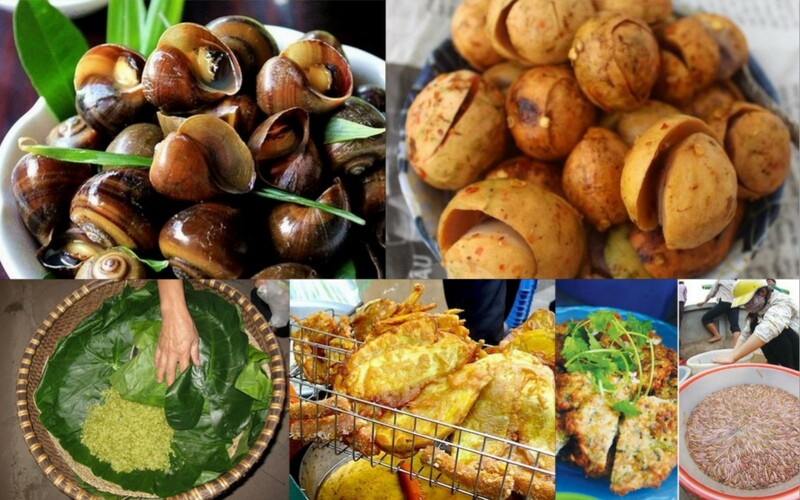 These specialties of Hanoi may not be able to compete with HCMC in terms of the variety of snail dishes. However, a bowl of boiled snails, along with a plate of crispy pork rolls are enough to blow up your mind. 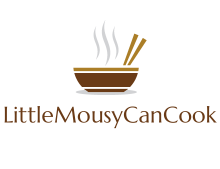 Its stunning flavor comes from personal secret of skilled hands mixing the dipping source and well selecting deliciously buttery boiled snails. 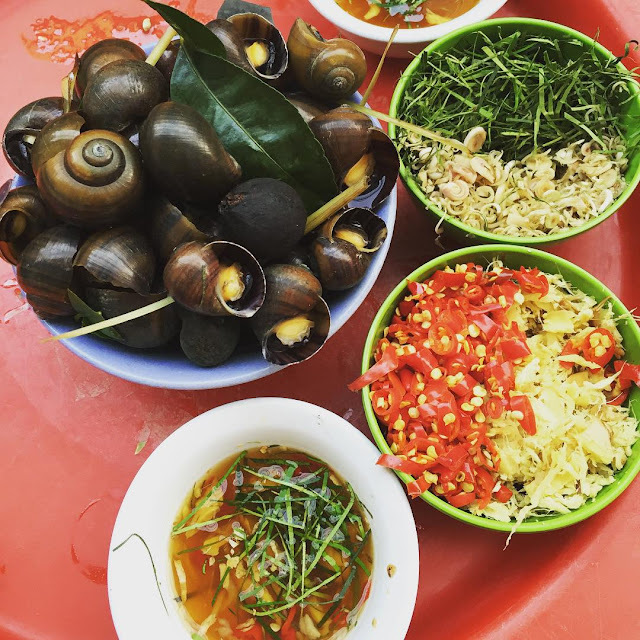 The snails are normally served with a mixture of fish sauce, lime, chili, sugar and lemongrass. 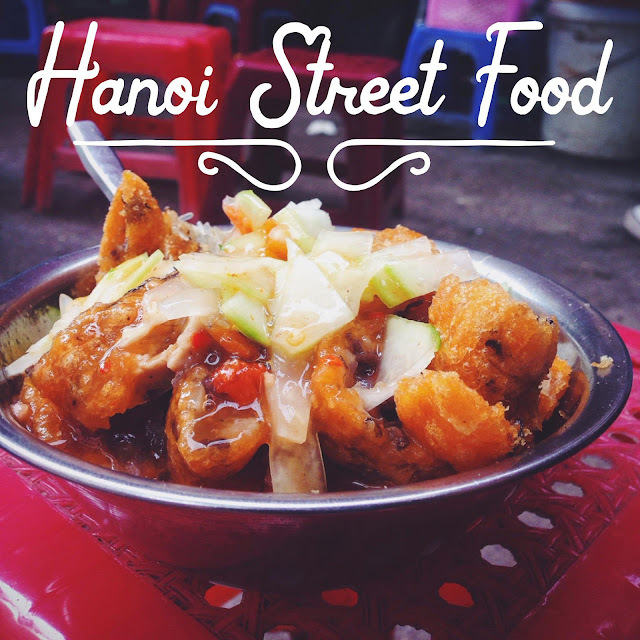 For how to make the fantastic sauce and where to find the best snail stalls in Hanoi, visit my posts again and again to get the best experience ever. 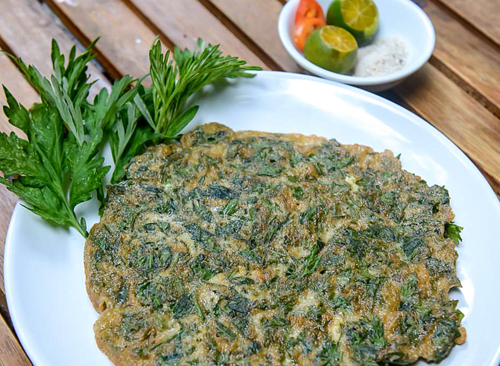 In winter, sales of baby duck egg and fried egg with mugwort have become much in demand, not only because they are delicious, cheap, but also healthy and quickly served. The bitterness of mugwort adds more flavor for the dish, making it unforgettable for the first try. If you dare to eat baby duck egg with mugwort soup, it’s well worth another try and for sure, there is nothing better for your health during these chilly days. Commonly found at local delis shops, these dumplings are best when eaten fresh from the steamer, when they are soft and redolent of the tealike fragrance of the banana leaf wrapper. Inside, the firmish-soft rice dough encases a savory pork, shallot, and wood ear mushroom. 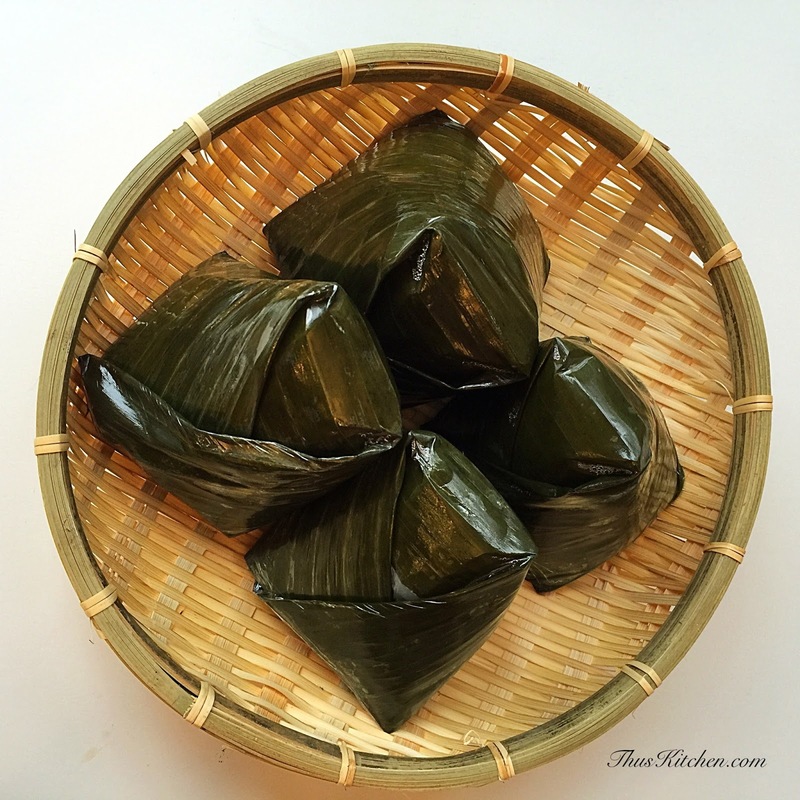 Traditionally, bánh giò are wrapped in many layers of banana leaf in order to produce the signature pyramid shape. The flavor is buttery, sweet-smelling but refreshing and well combined with sweet and sour cucumber, grilled pork and hot chili sauce. Amazingly attractive with its bright yellow color, "xoi xeo" is kept warm in a bamboo basket which is carried on the shoulder or fastened behind the bicycle. In other regions, sticky rice is mainly for breakfast, in Hanoi, however, it can be enjoyed all the day with indispensably familiar sound of street hawkers heralding across the city. 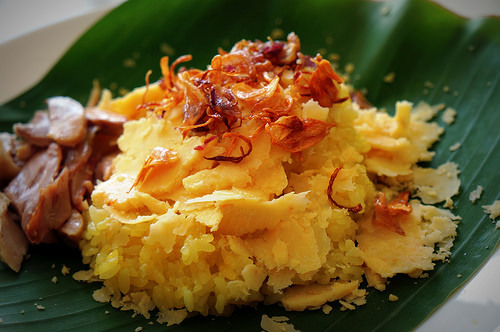 The ingredients for making "xoi xeo" include glutinous rice, turmeric powder, mung bean, shallot, and some liquid fat. The secret is that it is the turmeric powder, mixed with water and glutinous rice, that will create the natural yellow for the dish. 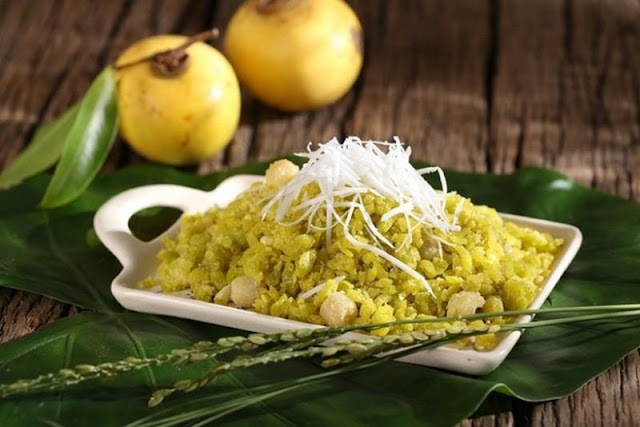 The yellow of the turmeric rice and bean, the brown of shallot, the distinctive green of banana leaf all mix and match perfectly, and combine to make an eye-catching "xoi xeo". 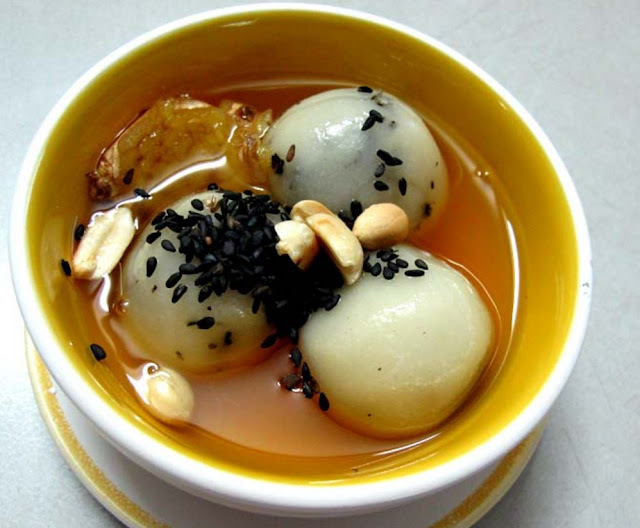 Bỏng has long been an indispensable treat since childhood of Vietnamese people in general and Hanoians in particular. 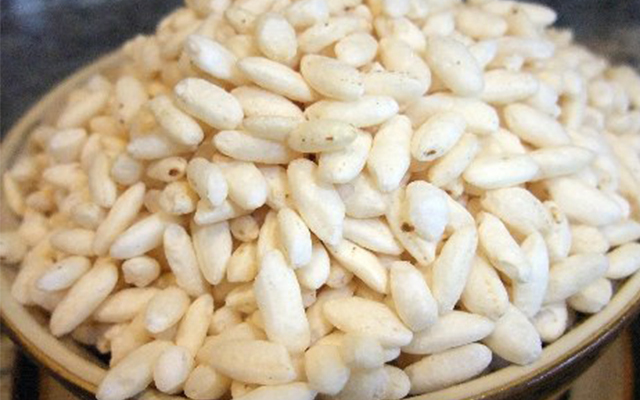 Bỏng can be made from corn, rice and etc. with or without added sugar, however it is always interesting to eat along with some hot tea while chatting with friends about life and weather. Bỏng is more delicious and crispy right after making, so eat them as fast as possible and you can’t keep it until tomorrow because it will soften when contact with the air. Hot sticky rice and sweet soup may be neglected during the scorching summer days, but it turns out to be a good fit during such a hard-to-please weather in winter with powerful appeal to any empty stomach every early morning or late afternoon. 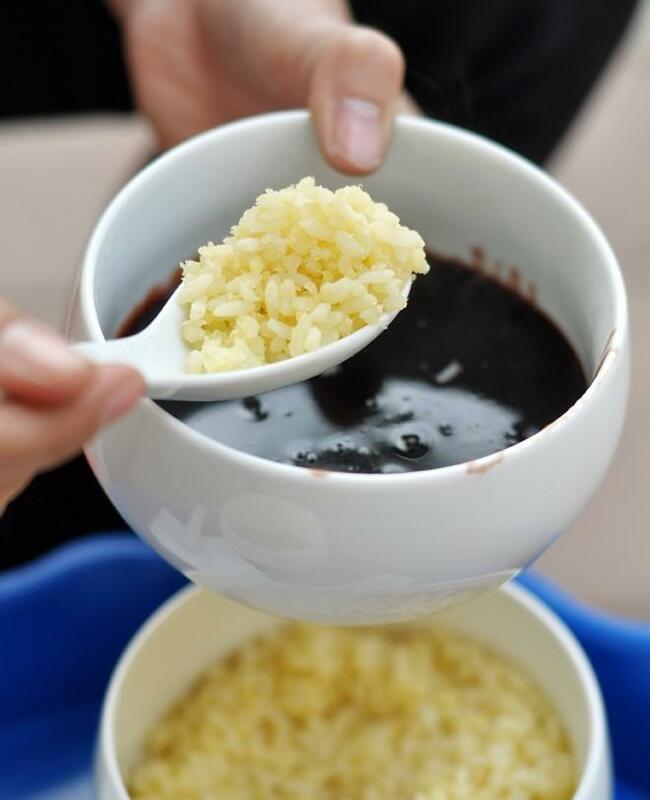 No matter it is black or green bean sweet soup, with sticky rice coated with mung bean, the dish creates a perfect combination. 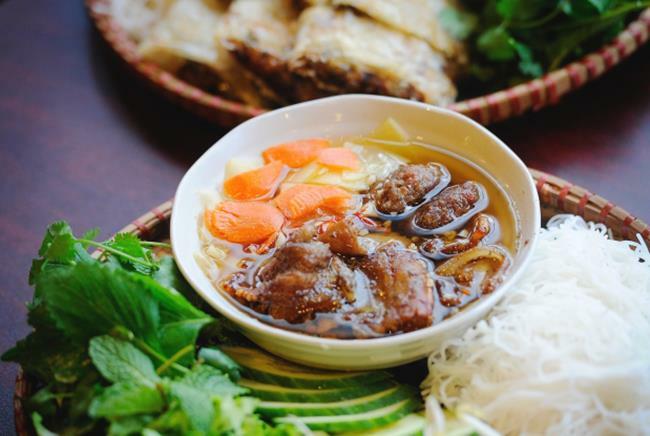 Hot floating cake soup is another specialty of Hanoi with the most traditional stalls belonging to the Old Quarter, 30 Hang Giay street. Though cheap, the special floating cake with black sesame or green bean inside and indispensable coconut shreds will comfort even the most difficult taster. It is also because of the aroma of ginger soup wafting in the air that attracts any passer-by. That explains why the kind of cake is favored whenever a new wave of north-east monsoon comes. Ice cream seems to be a must-try thing for its fan in the winter. 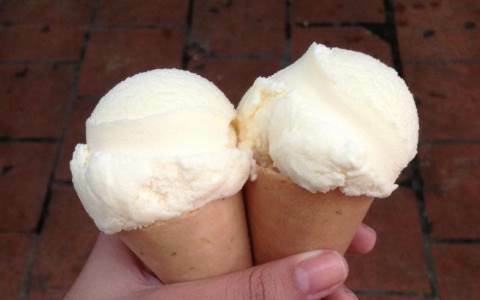 35 Trang Tien street is an ideal place to enjoy yourself the most genuine flavor of Hanoi ice cream. Just a mouthful of fresh ice cream with its crunchy cone can cause you feel like the inside of your head (or brain) has frozen. 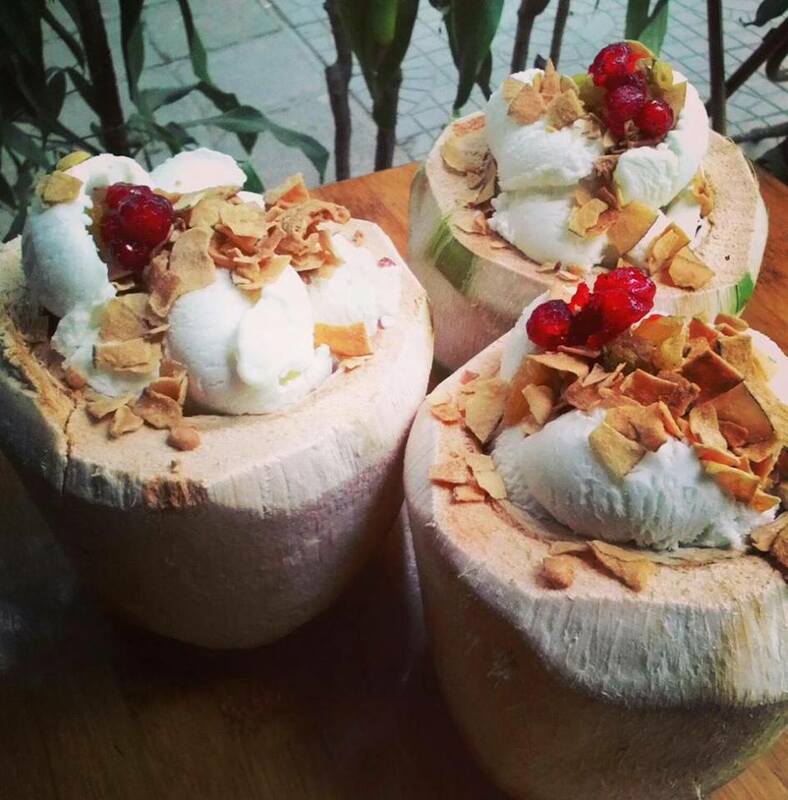 Besides you can also try coconut cream served directly inside a coconut somewhere in Thanh Nien street, and another one with beautiful view in Hang Than street, Old Quarter area. When the scorching and sweltering atmosphere of summer days have gone, tenderly replaced by a sweet breeze at dawn while falling leaves dying yellow the street, it is Autumn, a graceful and elegant lady has come and brought along her own miracles to Hanoi. Young green rice, ripen dracontomelon, fragrant Gold apple and daisy blossom all signal the most beautiful season in Hanoi to come. 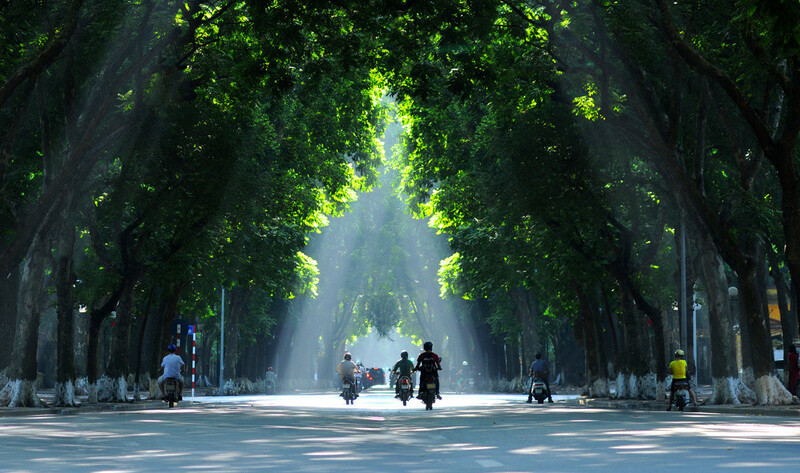 When the last summer rains fall down, carrying purity and cool atmosphere along, it is also the moment that autumn has arrived, knocking every door or corner of Hanoi. 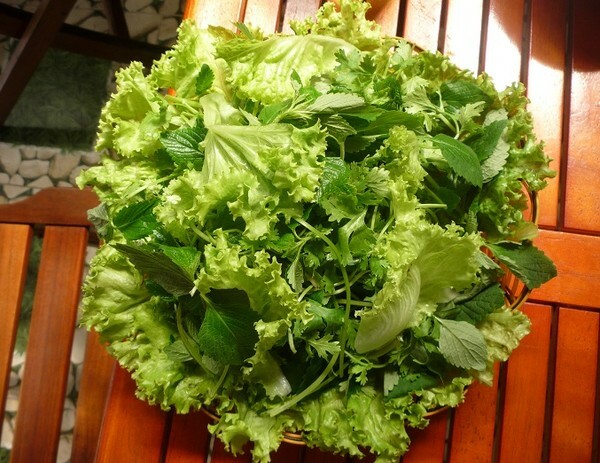 Specialties of this mild season are also brought along subsequently. 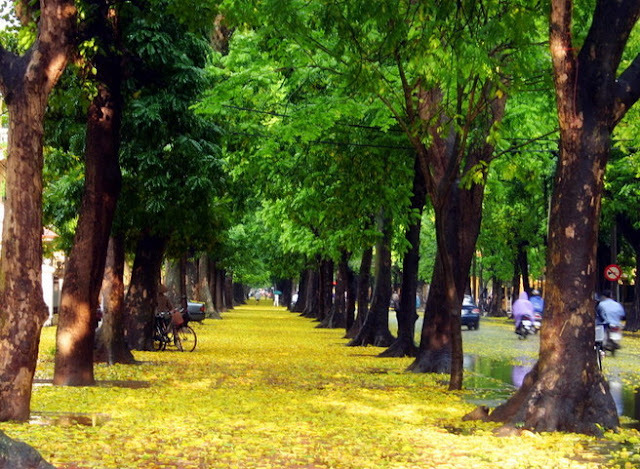 Hanoi reminds people of its beauty through the memories about autumn. Autumn, however, never falls on a certain day that we can surely know when it comes. Just when a whiff of slightly fragrant milk flower blossom or a sweet breeze streams through the window every morning, or when we come across a street vendor carrying Gold apple or young rice green, it is the autumn that people finally realize it has been there - in their daily breath. 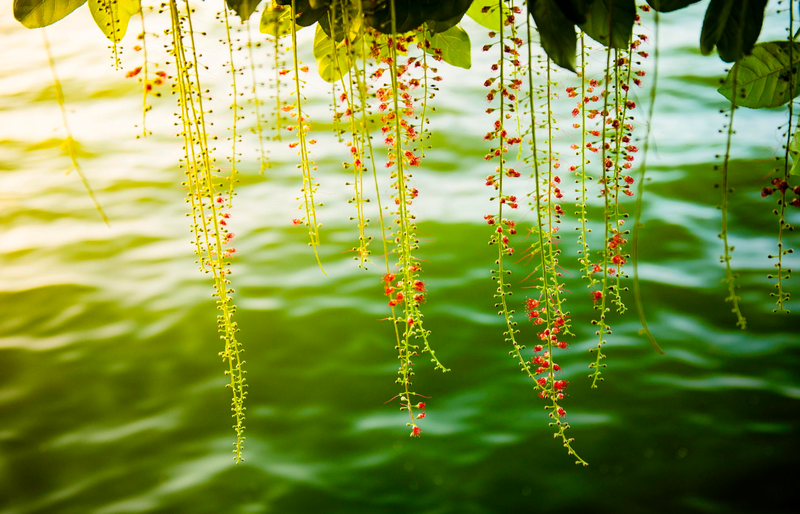 Dracontomelon is closely connected with the capital land, where the tree rows impressively stretch along Phan Dinh Phung or Hoang Dieu street. Hanoi is full of sunshine in summer, but pedestrians or motorbikes never feel intense heat whenever passing these streets, since Dracontomelon trees have fulfilled their role, creating not only a peaceful landscape but as much shade as possible also. In autumn, the streets wear a different shirt – the yellow color of falling leaves. Dracontomelon beauty, as a result, is captivating even the most difficult photographer. 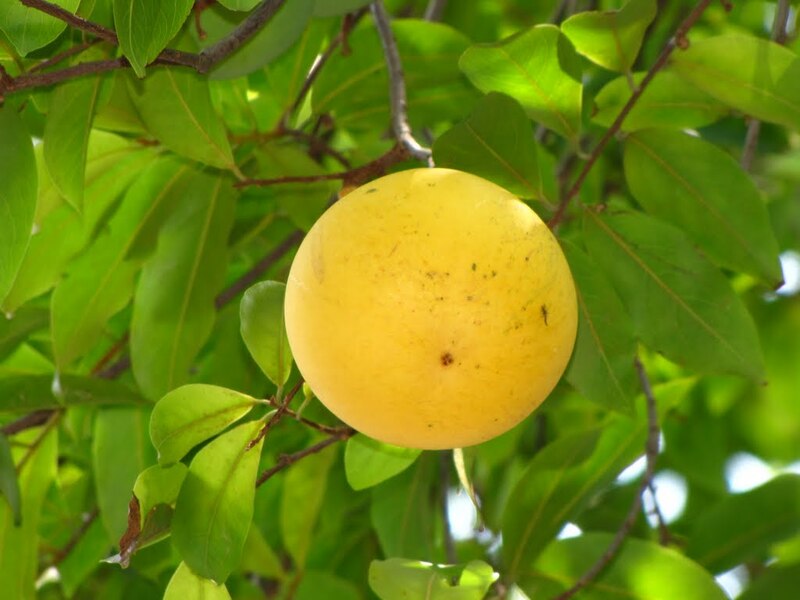 Autumn is also the season of ripe dracontomelon when such final yellowish fruits are harvested. 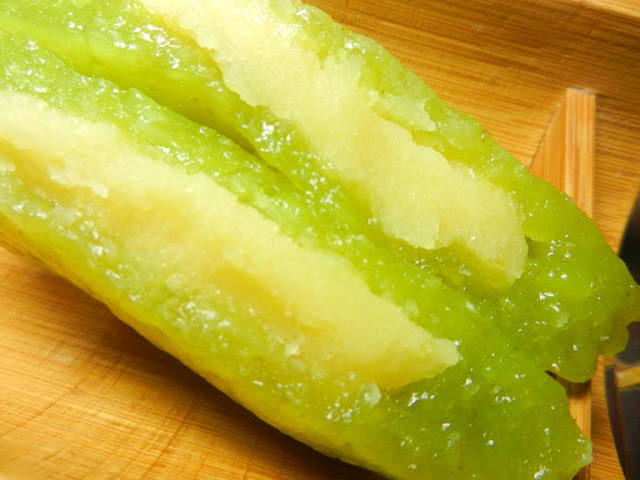 As its flavor is no longer too sour but a little bit sweet inside with crunchy outer skin, sugared dracontomelon become a daily treat of students after school and even a simple but powerful gift that a romantic man needs to convince his sulky girlfriend. 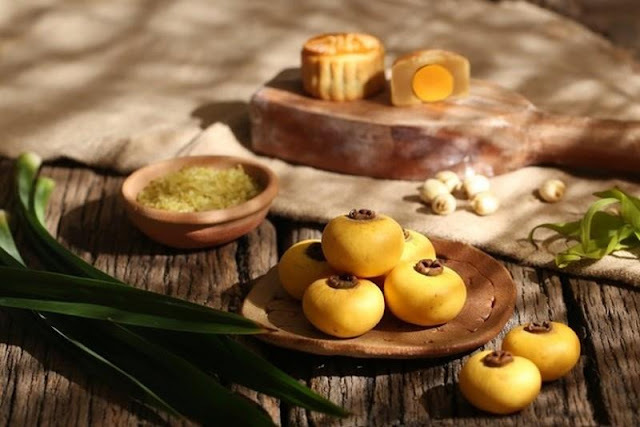 Original Hanoians will find it difficult to fill their missing piece when it comes the autumn without having a pack of green rice to make offerings to the ancestor. 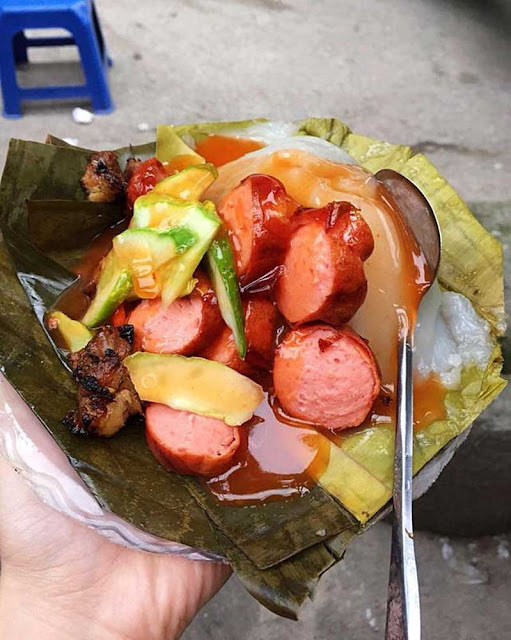 Green rice is carried by pole on shoulders of street vendors, originally wrapped in lotus leaves, creating a very pleasant fragrance and slight sweet flavor like fore-milk. 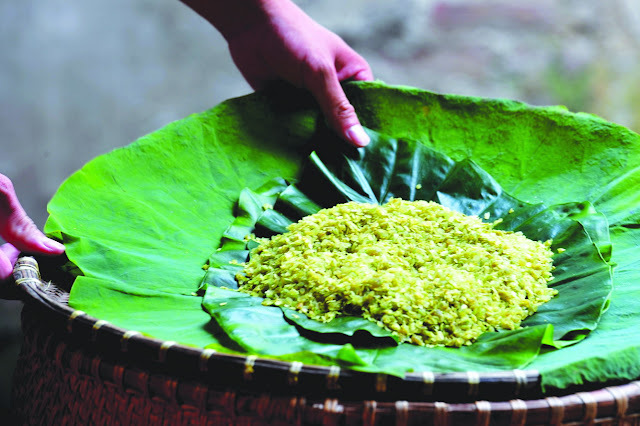 Green rice cake, green rice sweetened porridge or green rice flakes are among the best dishes of Hanoi with very distinct flavor. Banh com or Green rice cake is a special gift of Hanoi, which can be found in engagement ceremony. Just small and thin like a palm of hand, the cake has a light fragrance of green rice, a little bit sweet with green bean inside and several coconut shreds. 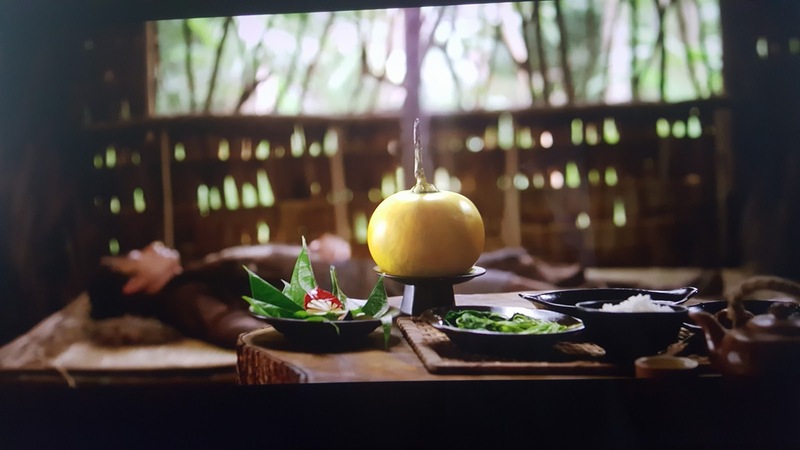 Vietnamese people in general and Hanoians in particular all feel so familiar with the image of Gold apple, though not to be eaten, it symbolizes the inner flawless beauty, faithfulness of Vietnamese women. In autumn, little girls are often bought a gold apple as a gift from the Mother to teach her child about beauty respect and looking up for miracles in life. Once upon a time...a very beautiful and good-natured girl named Tam after being killed by her cruel stepmother revived and lived in a Gold apple. 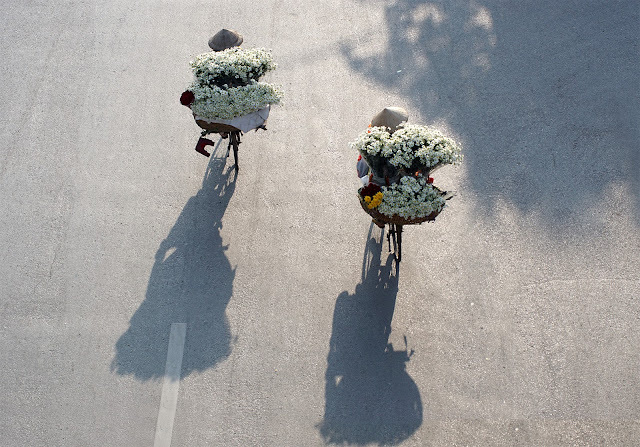 Early autumn is also the season of daisy blossom, whitening around Hoan Kiem lake, creating a new look for the capital city. Sitting on the pavement, having a hot cup tea in the middle of such cool days would be the best peaceful experience ever of any peoples. Obama and “bun cha” are among the two most popular keywords to be searched these days. After the event when Obama – President of the United States during his short visit in Vietnam having dinner with $6 noodles, Bun cha Hanoi has become a very special dish known by many many people in the world. 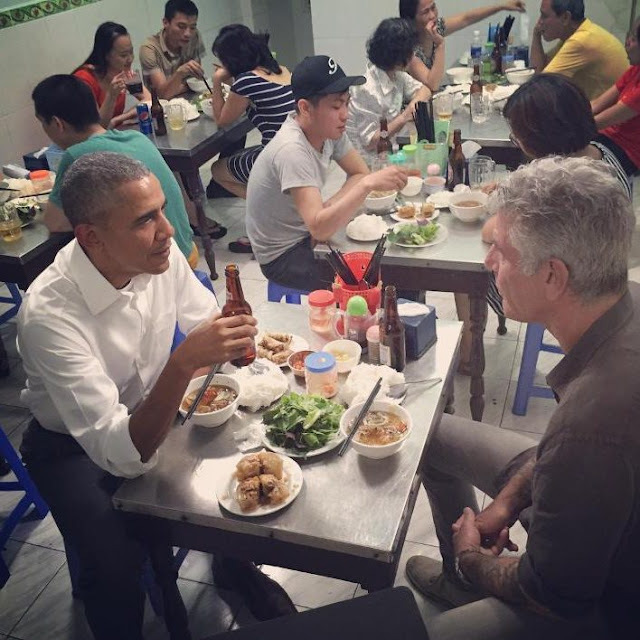 Despite some criticisms against Obama’s presidential status not to be in line with the image of sitting in a local store having beer and street food, it is the fact that Obama knew what he was eating, how charming it was. 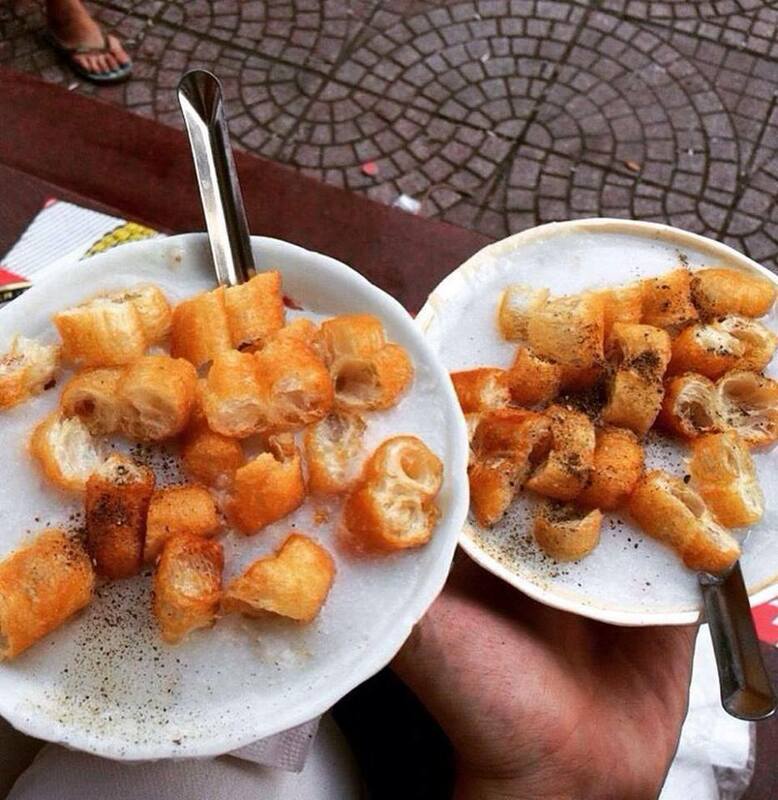 Importantly, having street food is the fastest way to well understand people of the country that you’ve arrived in. 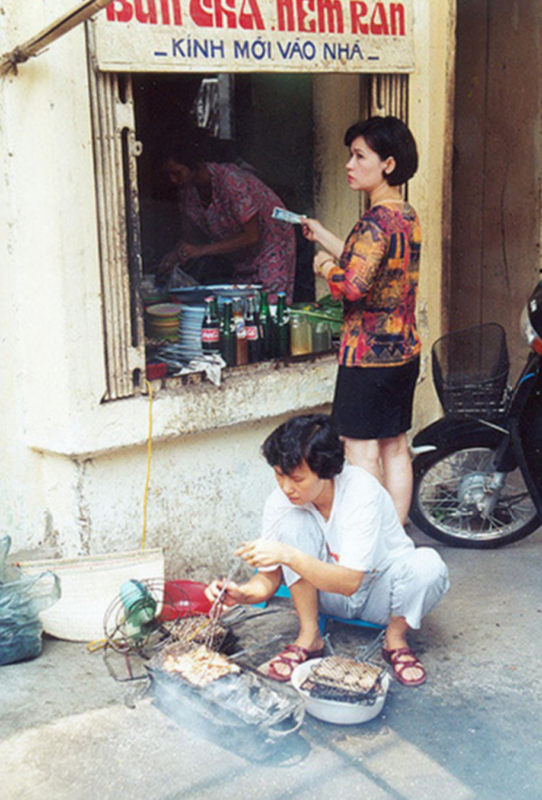 In Vietnam, Bun cha has long been a specialty of Hanoi. People love it and enjoy it everyday. 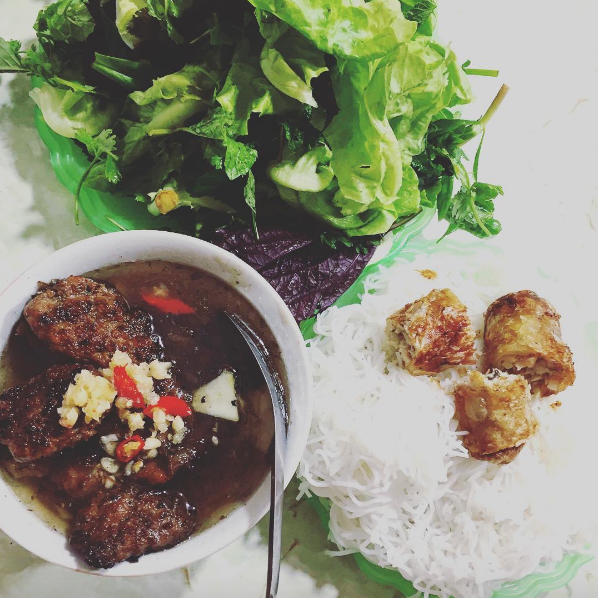 However, it can’t be denied that after Obama Bun cha phenomenon, bun cha has been widely popular than ever, not only to worldwide food lovers but also Vietnamese ones who feel so proud of local specialty. 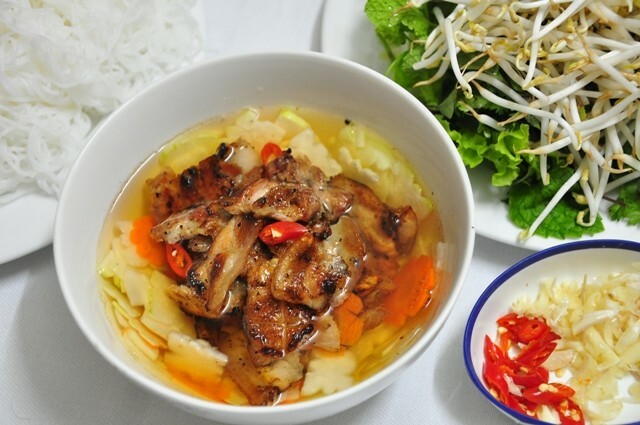 It is not so difficult to find a bun cha store in Hanoi. 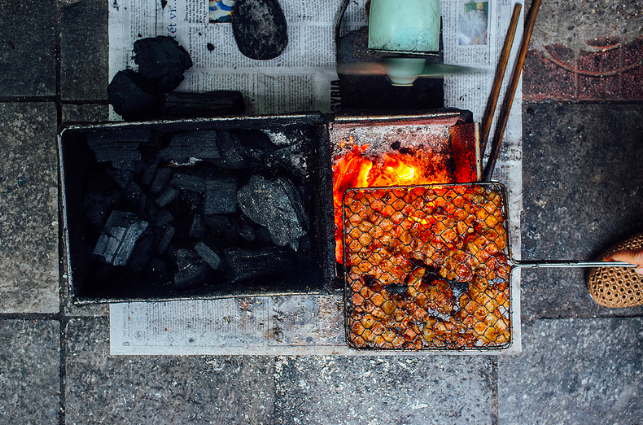 On every street of the capital, between 9a.m and 10 a.m, smoke from meat grilling flies to every corner, carrying along sweet-smelling of grilled chopped meat, which can made anyone passing by feel appetizing. Along one street may have different bun cha stores, but what is weird is that no stores are not crowded with customers. The dish is often served at noon, in summer when intense heat makes people go in for something cool, light but flavorful enough. 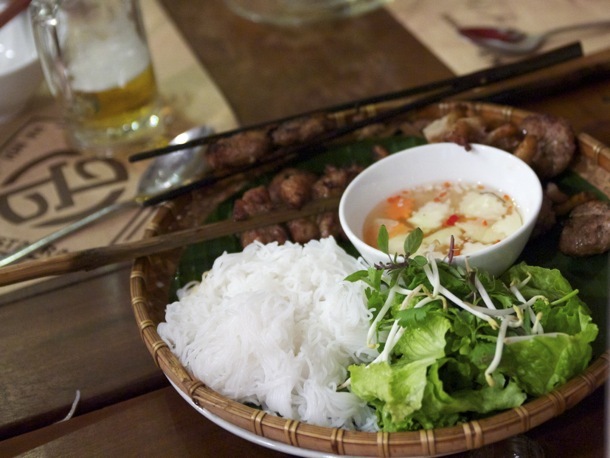 Fresh rice vermicelli with grilled pork is an ideal for such days. In the past, Bun cha was not cheap as making Bun cha is absolutely an art, in such a way so that tasters could feel best the sophistication of vermicelli, grilled pork and herbs all well combining together. 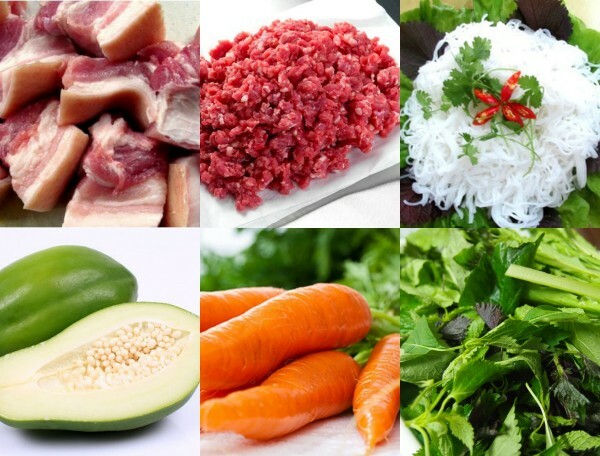 Main ingredients to make Bun cha include rice vermicelli, belly pork, shallots, spicy, carrot, green papaya, raw vegetables and well-mixed fish sauce. There is no need for a cabinet of traditional spices like beef noodles, nor to wait for season to come like snail noodles, in certain aspect, making Bun cha is so simple and easy to have one dish. 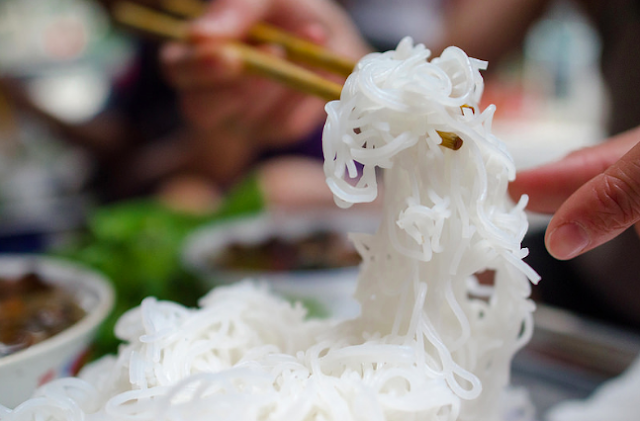 While vermicelli is easy to find based on some quality of white, soft, slender stick rather than the big ones in Hue rice noodles, and vegetables can be chopped down for fresh serve after washing and draining, it requires more techniques with grilled meat and fish sauce. There are two kinds of Cha (grilled pork) used, depending upon the cut of the meat. 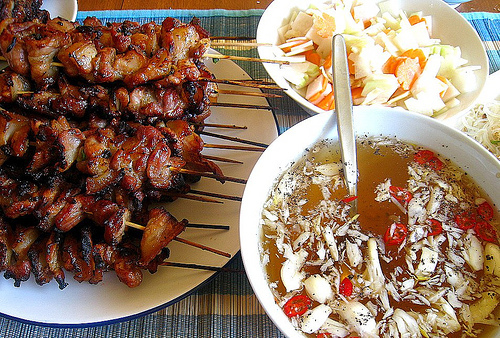 If the pork is cut into small pieces, it is called Cha Mieng (piece of grilled pork). 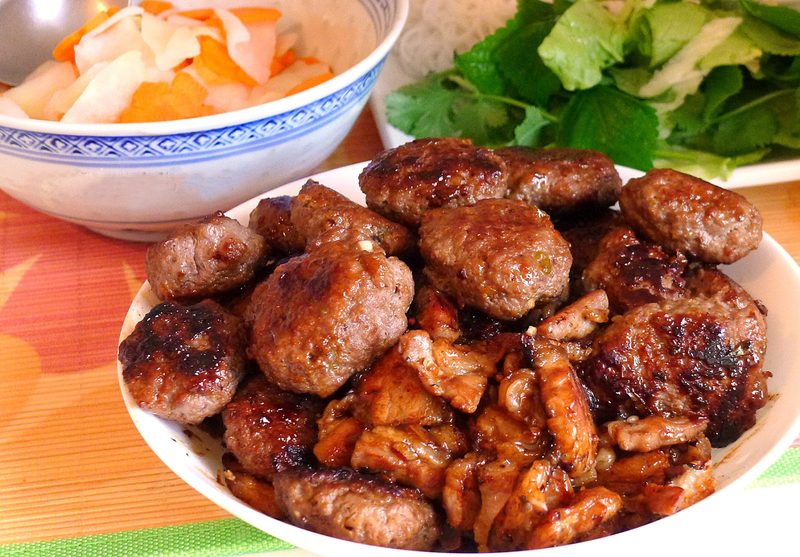 If it is minced prior to being shaped into small cubes, it is named Cha Vien (minced grilled pork). While Cha Vien is ground from pork shoulder, spiced and formed into flat pieces before grilling, Cha Mieng is well selected from belly pork, scent with spices overnight before grilling. Both of them in final product must be flavorful, fragrant and soft enough. It is the harmony in seasoning of Hanoians that makes the grilled pork remarkably outstanding among other dishes. Not too sweet like grilled pork ribs of Saigonese, the sophistication of Hanoi’s grilled pork comes from a little shallots to wake up senses, a little cockcroach color to be more impressive, a little fish sauce for flavorful the dish and a little sugar to hightlight the inner sweetness of the meat itself. After grilling, the meat is directly put into a bowl of well mixed fish sauce. The sauce must be well-balanced in order for not only the sweetness of the grilled pork not to be lost but also act as the “soul” to elevate the dish. Each store has its own way of making dipping sauce, which explains the existence of traditional bun cha with secret recipe handed from generations to generations. Indeed, making dipping sauce is an art. Any a bowl of fish sauce combine vinegar, sugar, hot chilly, garlic and pepper altogether but with different amount, depending on the taster, so that it will then contain all the essential tastes, sour, hot, salty and sweet. The fish sauce itself must be the best one and such ingredients like garlic, lime juice, chili and pepper must be well selected and combined. 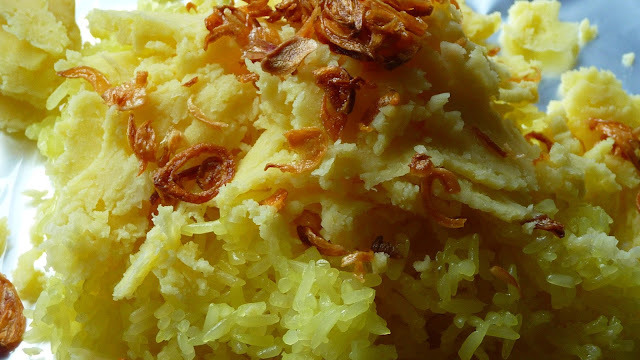 Soft, square green papaya and carrot slices are also added to decorate and elevate the flavor. 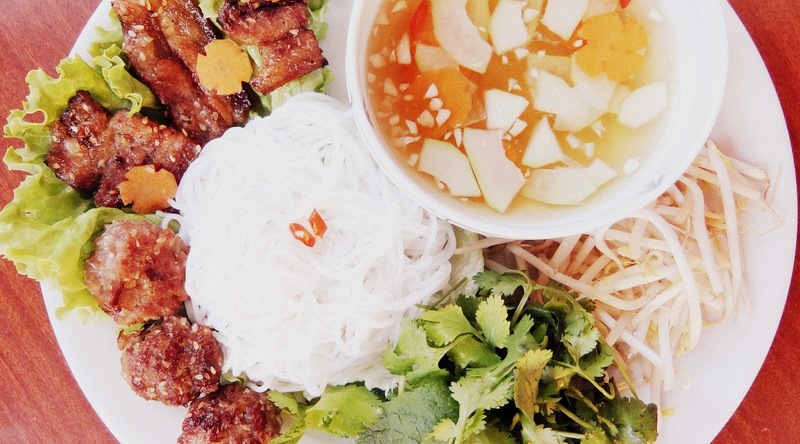 Bun cha attracts its tasters by the simplest details. 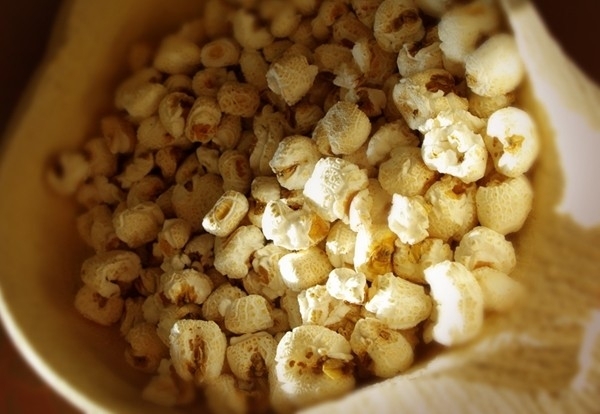 It also serve as a demonstration for those small and rustic but never mediocre ones. And by unique sophistication and skillfulness, Hanoians, have sublimated the streetside dish into a masterpiece of humankind.